The KJ-2000 AEW&C was demonstrated at the China International Aviation and Aerospace Exhibition 2014. Image: courtesy of Danny Yu. The KJ-2000 early warning aircraft performed its first flight in November 2003. Image: courtesy of Otherjoke (Wikipedia / Wikimedia Commons). The KJ-2000 aircraft is powered by four PS-90A turbofan engines. Image: courtesy of Dzerod. 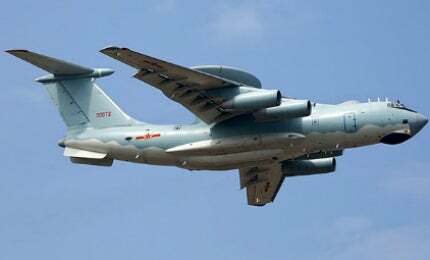 KJ-2000 (Mainring) is an airborne early warning and control (AEW&C) aircraft designed and developed by AVIC Xi’an Aircraft Industry Company for the People’s Liberation Army Air Force (PLAAF). The aircraft can detect, identify and track enemy targets flying at low altitudes and at long ranges. It can also be used to carry out command and control, battle management and airborne surveillance missions in all weather conditions. The aircraft was developed based on the airframe of A-50I (Mainstay) AEW&C aircraft. The first prototype of KJ-2000 performed its maiden flight in November 2003 and the first production aircraft entered into service with the PLAAF in 2004. An additional three aircrafts were delivered by the end of 2007. The aircrafts are operated by the 26th Air Division of the PLAAF. The KJ-2000 aircraft was displayed at the China International Aviation and Aerospace Exhibition 2014 (Airshow China 2014) held in Zhuhai. The A-50 aircraft detects and identifies airborne objects, determines their coordinates and flight path data and transfers the information to command posts. China, Russia and Israel signed a $250m agreement in 1996 for the supply of an advanced airborne warning and control system (AWACS) aircraft, outfitted with Israeli Aircraft Industries’s (IAI) EL / M-205 Phalcon (phased array, L-band, CONformal) AEW phased-array radar with 360° coverage, for use by the PLAAF. In 1997, Russia and Israel reached an agreement for the modification of one IL-76MD into A-50I AEW&C configuration, with an option for an additional three aircrafts, for a total cost of $1bn. An IL-76 airframe was transferred to Israel for integration of Phalcon long-range observation radar in October 1999. The deal was cancelled in July 2000, due to strong objections by the US Government on the installation of the PHALCON radar. Israel retrieved its radar and other electronic systems, and delivered the unfinished A-50I airframe to China in 2002. Chinese aircraft manufacturer AVIC Xi’an Aircraft Industry Company began modifications to the A-50I airframe in late 2002. The upgraded aircraft, designated KJ-2000, is fitted with an electronically steered phased-array radar system and electronics developed by Nanjing Research Institute of Electronic Technology (China Electronics Technology Company’s 14th Research Institute). KJ-2000 AEW&C aircraft is manufactured using aluminium alloy materials and small plastic parts. It is equipped with high-mounted wings containing trailing edges, mounted with aileron and flaps. The aircraft features an adjustable, triple tail section configured in T-style to provide increased stability. The aircraft features retractable tricycle landing gear to facilitate safe take-off and landing operations. The nose landing gear consists of a two-wheel bogie, while the main landing gear features two rotating four-wheel bogies. KJ-2000 has a length of 46.6m, height of 14.8m and a wing span of 50.5m. It has an empty weight of 92,500kg and a maximum take-off weight of 190,000kg. The aircraft is operated by a crew of five members and accommodates a mission crew of ten to 15 members. "The aircraft can detect, identify and track enemy targets flying at low altitudes and at long ranges." KJ-2000 early warning aircraft is equipped with an advanced, non-rotating, three-sided active electronically scanned array (AESA) radar system on top of the fuselage at the rear. Three flat radar antennas are mounted in a triangular configuration and are enclosed in a disc-shaped, fixed round radar dome for protection against wind and other aerodynamic forces. Each radar antenna is steered electronically to provide 120° scan coverage in both azimuth and elevation angles. The powerful radar system operates in either S or C-band. It can simultaneously detect and track multiple aerial and sea-based targets within a maximum range of more than 400km. In addition, the aircraft is installed with a solid nose cone to carry additional avionics for improved surveillance capabilities. KJ-2000 AEW&C aircraft is powered by four PS-90A turbofan engines developed by Aviadvigatel. Each engine generates a thrust of 16,000 kilogram-force (kgf). The power plant enables the aircraft to fly at a maximum speed of 900km/h and to a maximum flight range of approximately 5,000km. Service ceiling of the aircraft is 10,200m and endurance is approximately eight hours.